“There are two main reasons to redesign the mall,” says Andrea Burns, of Denver Community Planning and Development, pointing to rising maintenance costs and, also, an evolving civic role for the mall that no one could have predicted three-plus decades ago. When the 16th Street Mall was built in 1982, it was constructed as a transit mall. While pedestrians have always been encouraged to travel the mall, I.M. Pei’s original design plan focused primarily on linking (with transit) two of Denver’s regional transit centers: Denver Union Station and Civic Center Station. The mall, then, was originally developed as a transit-way for a growing population of 492,694 residents. Scenes from the shuttle. All photos by Daniel Tseng. We don’t need to tell you that Denver has mushroomed since the 1980s. 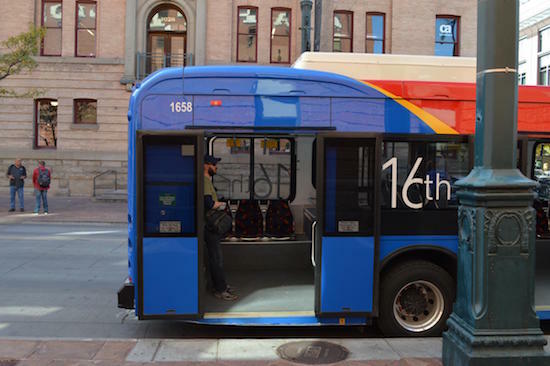 Last year, they city’s estimated population was over 693,000, and RTD reports that the free shuttles traversing 16th Street Mall serve 45,000 passengers on an average weekday. But today’s uses go way beyond transit. The mile-long corridor and outdoor mall has become a vibrant public space serving 130,000 workers and 22,000 residents in downtown Denver. The mall is a tourist destination, too, attracting tens of thousands of visitors annually with approximately 200 street-level retailers and restaurants and more than 1,400 hotel rooms. It’s no wonder that — even with designated bus lanes in use — congestion gets so bad on the mall during peak hours that buses can move slower than some people walk. “There certainly is a desire to look at the configuration of the mall itself, to make sure sidewalk spaces are sufficient to handle the large number of pedestrians we have,” says Susan Wood, RTD planning project manager. But from RTD’s perspective, problems associated with congestion pale in comparison to the cost of maintaining antiqued infrastructure. On a sunny Denver day, the 16th Street Mall can a beautiful place to dawdle. Look down, and you’ll immediately see why. An intricate system of granite pavers laid by Portuguese and Spanish craftsmen in 1981 grounds the mall, both literally and figuratively, with its rattlesnake pattern. But maintaining the mall’s original paving costs RTD about $1.2 million dollars annually. “Because of our weather conditions, water gets underneath the pavers and causes them to pop up, and then the pavers will crack off when a vehicle drives over them,” explains Wood. 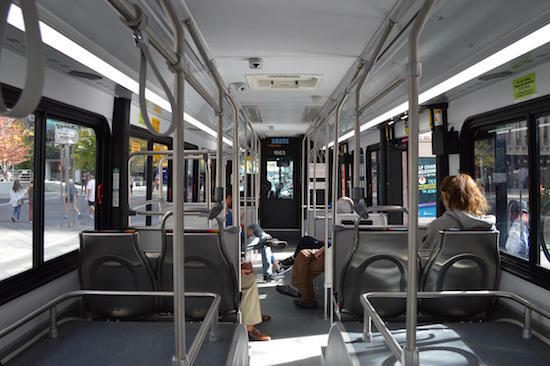 Pavers have caused some pretty heated debates since 2015, when RTD began researching the option of replacing bus lanes with a less costly surface. And they’re just one of the problems. Since its construction 35 years ago, the mall’s aging systems have reached their design life span. Other infrastructure elements — electrical lines, for example — are deteriorating underneath the buses. While RTD was exploring infrastructure updates, the City and the Downtown Denver Partnership launched a study, too — “The Mall Experience” — to look at the 16th Street Mall from a placemaking perspective. City planners have been working with Gehl, the design firm responsible for transforming Times Square in New York from a parking lot of a cultural hub, to identify ways to help the mall reach its full potential. Research shows that many pedestrians who use the mall are just passing through. “They’re not lingering,” Burns points out. She and Tami Door, CEO of the Downtown Denver Partnership, see a huge opportunity to reimagine what the 16th Street Mall could be while simultaneously updating its framework to address modern uses. Hence the City and the Downtown Denver Partnership are teaming up with RTD and a few other organizations — the Downtown Denver Business Improvement District, the Denver Urban Renewal Authority, and the Federal Transit Administration— to redesign the 16th Street Mall. Because the mall was built in 1982 with federal funds, all modifications have to undergo a National Environmental Policy Act review. This NEPA process is currently underway, and requires a thorough evaluation of several potential configurations for the mall. “We’ll continue through the federal process over the next couple of months, and by April we should have selected a preferred alternative,” Door says. Can a Few Feet Really Make a Big Difference? The 16th Street Mall stretches from Civic Center Station to Union Station, but the area city planners want to redesign is only 13 blocks long, ending before Union Station at Market Street. There is 80 feet of space between the face of the buildings lining either side of the strip, and all of the proposed redesign concepts have to do with how, exactly, that space will be divided. 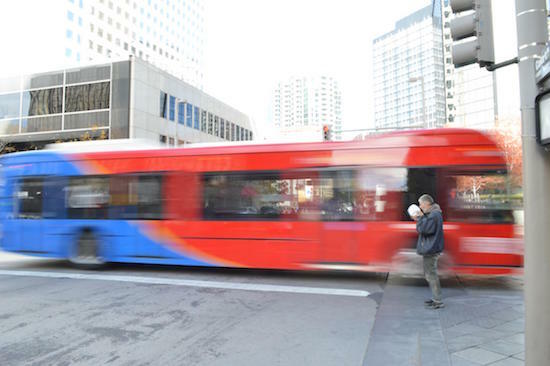 The three design options being discussed are called “Median Asymmetrical,” “Center Asymmetrical,” and “Center.” The option that’s selected — if one is selected — will determine how RTD’s Free MallRide buses travel between Broadway to Market Street. It isn’t as complicated (or as boring) as it sounds. The first option — “Median Asymmetrical” — is pretty similar to what you see today, with a median running between bus lanes, and blocks with sidewalks that are not always equal in width. Burns clarifies, “This option would leave the medians where we have them, and it would leave the asymmetrical blocks where we have them.” Sure, there would be a few tweaks — a few extra feet here and there — but for the most part only the underground infrastructure would change. The problem with keeping things the same, from the City’s perspective, is that some of the narrow sidewalk spaces “get really tight when they’re congested,” Burns says. In these areas, there isn’t always enough room for pedestrian foot traffic, and some city planners even worry about the safety of walkers. The “Center” design option is the biggest departure from the mall’s current scheme, which has both symmetrical and asymmetrical blocks of sidewalk — meaning that on some blocks the north and south sidewalks vary in width. The “Center” option would make all of the sidewalks along the mall symmetrical, or equal in width. Buses would run directly down the center of the mall, with no median between them, offering more physical space for pedestrians and, also, pedestrian-friendly amenities. A “Center” concept would also be a more equitable layout for property owners on the mall, points out David Kaufman, who has managed the University Building on the 16th Street Mall for 21 years and currently serves on the board of directors for the Downtown Denver Business Improvement District. You can think of the final proposed design concept — the “Center Asymmetrical” layout — as a middle ground between the other two alternatives. This plan would reconstruct mall for buses to run directly down the center with no median, while leaving the sidewalks the way they are, with widths varying in symmetry. As Burns describes it, “This leaves all asymmetrical blocks as they are, but moves all the medians, so the buses start and end together, sharing two center lanes.” The design would ultimately deliver wider sidewalks on both sides of the transit, allowing for gathering options like those described by Door above. 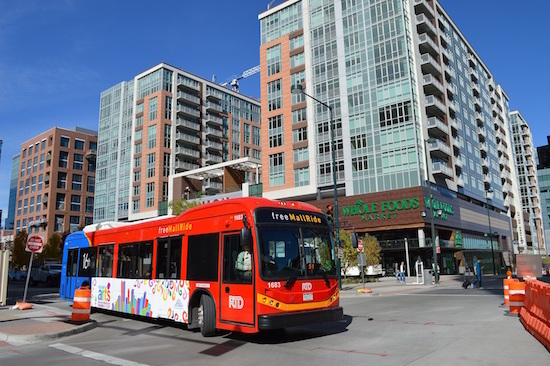 As far as RTD is concerned, any of the proposed plans would be fine. “This is a really important regional link for us, and as long as we can maintain our level of service, we’re good with any of the options,” says Wood. Technically, there are four options currently on the table. “When we talk about options — when you do a federally funded process — one of the proposals is always to do absolutely nothing,” Door explains. The federally mandated NEPA process is expected to wrap up in June; assuming the “No Build” option is not selected, final design planning will continue after NEPA is complete. But more design concepts could potentially be evaluated based on public input. 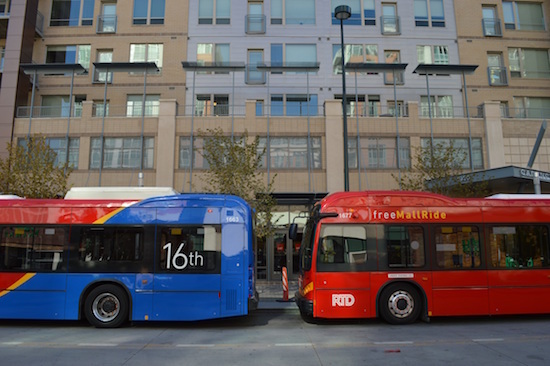 If you’re interested in learning more of offering feedback, drop in for the next 16th Street Mall Open House on Wednesday, October 18, from noon to 1 p.m. or 5 p.m. to 6 p.m., at the RTD station located at 1600 Blake Street. So What Would a Mall Facelift Cost Taxpayers Anyway? There’s no price tag attached to any of the design concepts, and officials aren’t ready to talk about it. “I have no idea what this would cost,” Door says, noting that a project budget can’t be determined until a preferred alternative is selected. The last time a comprehensive analysis was performed on 16th Street Mall, in 2010, officials looked at how much it would cost to repair the mall without altering its current alignment. The estimated cost was $65 million. But Door doesn’t think those findings are relevant anymore. “Costs have changed since then, and the mall is in greater disrepair now,” she says. The cost might still be up in the air, but city planners have already identified over $90 million dollars of potential funds, says Door, pointing to $72 million dollars that are set aside through DURA, roughly $10 million in grants from RTD, and another $13 million dollars from the municipal government — if city voters approve Denver’s $937 million bond package in November.